Here is another beer from from my Boston trip. This one is made by Jack’s Abby, a brewery located in Framingham, MA that specializes in lagers (see my earlier review of Kiwi Rising by Jack’s Abby). 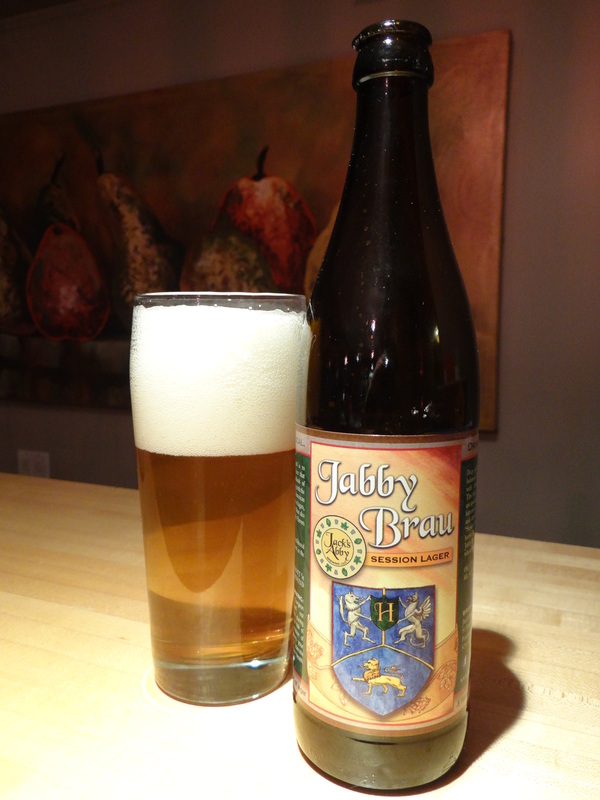 Jabby Brau is made with Pilsner and Munich malts and American hops and dubbed a session lager by Jack’s Abby because of its 4.5% abv. In other words a beer style not so different from the a mass produced lagers like Budweiser, Coors and Molson, but importantly without any adjunct malts (rice, corn, …). Let’s see if it can rise above those beers. The color of this beer is a clear golden yellow with a big fluffy, pure white head as you can see in the picture above. Over a few minutes the head settles out to just a scrim on top of the beer without leaving very much lacing. The aroma is crisp biscuit-like malts, slightly sweet with just a hint of fruit in the background, it smells like a bit of a hybrid between a Dortmunder lager and a Pilsner. The taste is crisp and clean, with light bready malts and a dry clean finish. The hops keep things interesting but they are definitely in the background, with very little bitterness. There are not enough hops to call this a hoppy lager in my book. It has a light, carbonated mouthfeel. I had this beer twice with meals (once in Boston with Fish and Chips and once at home with scalloped potatoes) and while it is good to wash things down with, its flavors are delicate and easily overwhelmed by the food. Overall I think this beer is done well for what it is, but in the end it is a refined version of the ubiquitous American lager. It’s an easy drinking beer and it would be a good beer for the hot days of summer when you want to drink beers over an extended period of time, but in my opinion there are alternatives that are both a little more interesting and a little more affordable that can fill that need (Dortmunder Gold, Scrimshaw Pilsner, and Bells Amber Ale all come to mind).